There are several events occurring in the next few months, so make sure to check out the professional events listed on our website for registration dates and deadlines. 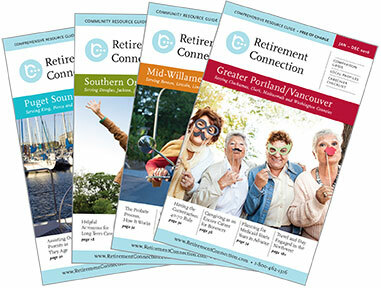 The next ANNUAL Retirement Connection Guide for Puget Sound is wrapping up and there are only a couple of weeks before printing. Please let me know of any corrections needed, additions you would like included, or changes to be noted. The next edition hits the streets in April and will not be updated for a full year. If you know of an office that is moving we really want to know ASAP. We have sent emails to each housing and home care agency to update their grid information and we have received a huge response already. We have also begun calling those that have not yet replied to ensure the accuracy of information. Additionally, this is also a great time to refer others into the guide as a sponsor; I would greatly appreciate any referrals you feel I should connect with for inclusion in the guide. Retirement Connection Guide lists EVERY housing, home care, hospice, senior center, meals on wheels site, and so much more. We are honored to be a valuable resource for Hospitals, Physicians, along with Area Agencies on Aging, and excited to see the increased use at each office as they become more and more familiar with our guide. Thank you for sharing the guide with the families you serve.